Harold Harefoot (c. 1015–March 17, 1040) was King of England from 1035 to 1040. His suffix, "Harefoot" was for his speed, and the skill of his huntsmanship. He was the son of Canute the Great, King of England, Denmark, Norway, and of some parts of the Kingdom of Sweden, through his first wife Aelfgifu of Northampton. Though there was some skepticism he was really Canute's son, this was probably just propaganda by the opponents of his kingship. After Canute's death (November 12, 1035), Harold's younger half-brother Harthacanute, the son of Canute and his queen, Emma of Normandy, was legitimate heir to the thrones of both the Danes and the English although, unlike Harold, he was of foreign lineage while Harold's mother was English. Harthacanute, however, was unable to travel to his coronation, because his Danish kingdom was under threat of invasion by King Magnus I of Norway and Anund Jacob of Sweden and he was trying to defend his royal claims in Scandinavia. England's magnates favored the idea of installing Harold Harefoot temporarily as regent, due to the difficulty of Harthacanute's absence, and despite the opposition of Godwin, the Earl of Wessex (who subsequently changed allegiance), and the Queen, he eventually wore the crown. Harold survived an attempt to unseat him led by Alfred Aetheling and Edward the Confessor, Emma's sons by the long-dead Ethelred the Unready, in 1036. According to David Hume, Harold enjoyed the support of the Danes, Harthacanute that of the English, who regarded his mother, Emma, as their Queen. Although she was a Norman, she appears to have been embraced by the English as one of their own; her coronation ceremony in 1017 stressed her status as an English Queen who, by her marriage to Canute, made him English too. Harold's reign more or less marks the end of England's Anglo-Saxon period. historical force favored a closer relationship between England and continental Europe, which was to be achieved through Emma's Norman family in the person of her great-nephew, William I of England. Arguably, had England remained an off-shore island culturally isolated from Europe, she would not have played the role she was later destined to play in world affairs, emerging as a major power and ultimately as a defender of freedom against tyranny in World War I and World War II. Aelfgifu of Northampton may have been Canute's legal wife according to pagan rather than Christian rites. At this period, pagan and Christian rites were practiced in parallel even by kings. It was not unusual, either, for a man of rank to set aside his marriage vows if the prospect of a better marriage presents itself. It is difficult to see how he could have officially divorced her at this time when Roman Catholic law would have made it almost impossible for a man to divorce a woman with whom he had consummated the marriage. It is more likely that the marriage itself was not recognized as valid by the Church. After becoming King of England, according to the Encomium Emmae Reginae, written about 1040 or 1041, Canute resolved to marry the widow of King Ethelred in order to legitimize his own claim to the throne. She made it a condition that any male son by Canute became heir-apparent. David Hume refers to a treaty between Canute and Emma's brother, Richard II of Normandy stipulating that any son by Emma would become his heir. Canute had obviously put Aelfgifu aside because his marriage with Emma was carried out by the Archbishop of Canterbury as was their joint-coronation. For the first time ever, as Queen, Emma was to have a "share in the King's rule." Aelfgifu appears to have continued to live in comfort in Northampton, with her sons. She also appears to have exercised some degree of political influence among the Northern barons, despite her dubious statement. When Canute died in 1035, Harthacanute was declared King but was absent from England involved in securing his rights to the Scandinavian kingdoms which his father had ruled. The Anglo-Saxon Chronicle chose to be skeptical about Harold's claim to be Canute's son; the claim "seemed quite incredible to many men." With the north at least on Harold's side due to a deal, of which Earl Godwin, despite having faithfully served Canute, was part, Emma was settled in Winchester, with Harthacanute's housecarl (soldiers of the royal household, often sons of the barons raised at the court). There is evidence that Aelfgifu of Northampton was attempting to secure her son's position through bribes to the nobles. According to the Encomium Emmae, though, the Archbishop of Canterbury refused to crown Harold Harefoot. Emma may have been regent for Harthacanute; certainly, she was protecting his interests and had the royal treasury in her possession. During 1035, Harold seized "all her best treasure," perhaps including the royal regalia. and the Kingdom of England was practically his. Emma, though, was not impoverished because in 1034 treasures would be seized from her a second time and even after that she continued to patronize the Church. According to the Encomium Emmae, though, the Archbishop of Canterbury refused to crown Harold Harefoot. There is evidence that Aelfgifu of Northampton was attempting to secure her son's position through bribes to the nobles. The Encomium was commissioned by and written for Emma shortly after she took refuge from Harold, and is by no means sympathetic towards him. Due to Canute's generosity to the Church, accounts written of this period - by clerics - tend to be sympathetic towards. Accounts written by Norman writers after the 1066 Conquest are also sympathetic towards Emma's sons because it was through Emma, his great-aunt, that William I of England claimed the throne. Comparatively little is therefore known about Harold. In 1036, Alfred Atheling, Emma's son by the long dead Ethelred, returned to the kingdom from exile in Normandy with his brother Edward the Confessor, with some show of arms. With his bodyguard, according to the Anglo-Saxon Chronicle he intended to visit his mother, Emma, in Winchester, but he may have made this journey for anything other than a family reunion. As the "murmur was very much in favor of Harold," Alfred was captured on the direction of Godwin, on Harold's side despite his faithful service to Canute (probably bribed by Aelfgifu) and the men loyal to Harefoot blinded him. He subsequently died soon after due to the severity of the wounds, his bodyguard similarly treated. The Encomium has Harold send a forged letter from Emma to her sons, asking them to visit her. Authors James Campbell, Eric John and Patrick Wormald take it that the letter was in fact genuine; "presumably the encomiast sought to explain it away because of its disastrous results." In 1037, Emma of Normandy took refuge in Bruges, in Flanders, and Harold was de facto king. The Anglo-Saxon Chronicle says that Harold drove Emma "out without any pity against the waging winter." It stresses that Emma was hospitably received, protected and entertained in Bruges as long as she needed asylum. The historian Sir Frank Stenton, considered it probable that his mother Aelfgifu was "the real ruler of England" for part or all of his reign. If so, with her rival Emma, Aelfgifu shares in the distinction of ruling through her sons - Emma appears to have exercised considerable authority during Harthacanute's reign from 1040 to 1042 but less when Edward became king. Her own account speaks of a Trinity of mother and sons as sharers in the rule of kingship. While little is known of Harold's rule, it appears that he was not challenged during the five years that followed, until his death in 1840. He may have reached an agreement with Harthacanute by which he governed England as regent. His own son, Elfwine, made no bid for the throne, so the way was open for Harthacanute to succeed. In the light of the lack of accounts of oppression, controversy or revolt Harold's reign may have been quite peaceful. Hume has it that he did nothing remarkable during his four years, "gave … a bad specimen of his character" and died little regretted or esteemed by his subjects." Harold died at Oxford on March 17, 1040, just as Harthacanute was preparing an invasion force of Danes, and was buried at the abbey of Westminster. His body was subsequently exhumed, beheaded, and thrown into a fen bordering the Thames when Harthacanute assumed the throne in June, 1040. His supporters later rescued the body, to be buried in a church which was fittingly named St Clement Danes. Harold's son, Elfwine, who became a monk and Abbot on the continent did not contest the throne. Aelfgifu of Northampton disappears with no trace at this space in time. 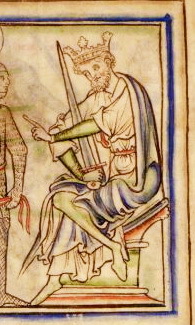 According to the Anglo-Saxon Chronicle, Harold Harefoot ruled for four years and 16 weeks, by which calculation he would have begun ruling two weeks after the death of Canute. Harold's legal claim on the throne depends on the status of Canute's marriage with Aelfgifu, which may or may not have had the blessing of the Church, which at this time was responsible for both marriage and divorce. Conditions for the granting of the latter were almost non-existent, unless it could be proved that either party did not properly consent or that the marriage was not consummated, which did not apply in this case. It is more likely that the marriage had been contracted using a pagan right. The tradition of primogeniture was not firmly established at this time. In fact, any son, legitimate or not, might decide to contest the throne. William the Conqueror (William I of England) was illegitimate but was named heir by his father, Robert I of Normandy and illegitimacy did not prevent William from claiming a relationship with his great-aunt in pursuance of his ambition to ascend the English throne. If it is true that Harold enjoyed the support of the Danes, it could be because Christianity was less established at this time in Scandinavia, and the Danes honored Canute's pagan marriage over his Christian marriage. So little is known of his reign that an assessment of its legacy is problematic. What can be said is that if he had succeeded in establishing a lineage, the crown might not have passed, as it did, to Emma's great-nephew, this ending the Anglo-Saxon period of England's history. On the other hand, he did not achieve this and the crown did pass to Normandy, and as a consequence the story of England became much more closely entwined with that of Europe, changing the course of history. Emma had been given in marriage to Ethelred to create a cross-channel alliance against the Vikings, who constantly raided England and impoverished the Kingdom through the Danegeld tax. England was reaching a point in history when she could not remain aloof from European politics but needed alliances and allies. Anglo-Saxon culture was different from that of most of France, her nearest neighbor. The Norman ascendancy resulted in the development of a blended culture, mixing the old Anglo-Saxon with the French or Norman culture of the newcomers. History was in favor of the Norman cause, not the Anglo-Saxon, at this juncture. ↑ For an explanation of this etymology, see Albert Le Roy Bartlett and Howard Lee McBain, The Essentials of Language and Grammar (New York, NY: Silver, Burdett and Co., 1906), 28. ↑ David Hume, History of England, Volume I., 2006, 150. available online "Hume, David. 1754-62." The History of England, Volume I Project Gutenberg. Retrieved January 23, 2017. ↑ Pauline Stafford, Queen Emma and Queen Edith: Queenship and Women's Power in Eleventh-century England (Malden, MA: Blackwell's, 2001), 177. ↑ In comparison, Ireland for example, almost as physically close to the mainland, did not become involved in European affairs and remained on the side-lines of world history, although making a significant cultural contribution. Of course, Ireland was also incorporated into the British Empire, so did participate in and contribute to the development of British power. However, it was England that acquired an empire and, before the United States entered the war, led the battle against Adolf Hitler and world tyranny. ↑ Harriet O'Brien, Queen Emma and the Vikings: Power, love and greed in eleventh century England (New York, NY: Bloomsbury, 2005), 33. ↑ Alistair Campbell and Simon Keynes, Encomium Emmae Reginae (Cambridge, UK: Cambridge University Press for the Royal Historical Society, 1998), 33. ↑ Anglo-Saxon Chronicle (Eastbourne, East Sussex: Gardners Books, 2007), 106. ↑ 9.0 9.1 9.2 9.3 Timothy Bolton, Reign of King Harold Harefoot (1035 - 1040) The Literary Encyclopedia. Retrieved January 23, 2017. ↑ Campbell and Keynes, 1998, Xiii. ↑ 11.0 11.1 11.2 F. M. Stenton, Anglo-Saxon England. (New York, NY: Oxford University Press, 1989), 420–421; quoting segments from the Anglo-Saxon Chronicle. ↑ Omeljan Pritsak, The origin of Rus. (Cambridge, MA: Harvard University Press for the Harvard Ukrainian Research Institute, 1981, ISBN 0674644654), 343. ↑ James Campbell, Eric John, and Patrick Wormald, The Anglo-Saxons (New York, NY: Penguin, 1991), 216. ↑ Campbell and Keynes, 53. ↑ This may have been motivated partly in response to the murder of Alfred, Harthacanute's half-brother, and partly for his perceived theft of the crown. ↑ Anglo Saxon Chronicle manuscript E, 1039 (1040); for the calculation, see Michael Swanton translation, of Anglo-Saxon Chronicle, 1035–40. (Routledge, 1996), 161, note 18. Bartlett, Albert Le Roy, and Howard Lee McBain. The Essentials of Language and Grammar. New York, NY: Silver, Burdett and Co., 1906. Bolton, Timothy. "Reign of King Harold Harefoot (1035 - 1040)". The Literary Encyclopedia. Retrieved January 23, 2017. Campbell, Alistair, and Simon Keynes. Encomium Emmae Reginae. Camden classic reprints, 4. Cambridge, UK: Cambridge University Press for the Royal Historical Society, 1998. ISBN 978-0521626552. Campbell, James, Eric John, and Patrick Wormald. The Anglo-Saxons. (Penguin History) New York, NY: Penguin, 1991. ISBN 978-0140143959. Hume, David. The History of England Volume I. Charleston, SC: BiblioBazaar, 2006. O'Brien, Harriet. Queen Emma and the Vikings: power, love and greed in eleventh century England. New York, NY: Bloomsbury, 2005. ISBN 978-1582345963. Pritsak, Omeljan. The origin of Rus. Cambridge, MA: Harvard University Press for the Harvard Ukrainian Research Institute, 1981.. ISBN 0674644654. Stafford, Pauline. Queen Emma and Queen Edith: Queenship and Women's Power in Eleventh-century England. Malden, MA: Blackwell's, 2001. ISBN 978-0631166795. Stenton, F. M. Anglo-Saxon England. New York, NY: Oxford University Press. 1989. ISBN 978-0192822376. This page was last modified on 27 January 2017, at 20:08.